I picked up the keyboard dock for the iPad, and downloaded the iPad WordPress app so I can update my many websites running WordPress. So far I’m impressed, it seems to be working really well. The only thing I’m going to have to get use to is not having a mouse, and instead touching the screen to move around. Having a keyboard is way more useful and efficient than trying to type up long blog posting using the iPad screen keyboard. If you have an iPad, I highly recommend the keyboard dock. To all the fathers out there, Happy Fathers Day! I signed up for Netflix yesterday so I could use their ‘Watch Instantly’ feature from my laptop. Turns out it’s some what of a disappointment, mostly because the Microsoft Silverlight software you are required to download and use is total crap. The movies are choppy, im getting around 5 fps, however the sound is ok. At first I thought it was just my computer, I checked to make sure I met the system requirements, and I did. After searching the web I discovered many people complaing about the same thing, turns out Microsofts Silverlight software just isn’t up to the task. No surprise there. I decided to give the ‘Watch Instantly’ feature a try on my iPad, and it did work suprisingly well, though I don’t want to watch all movies from my iPad. I’d have to say that if you plan to watch Netflix from a Netflix enabled device such as a blueray player, dvd player, xbox 360, iPad or some other device that does not require Microsoft Silverlight, then this service may be ok. However I would try a different movie sevice if you plan to watch on your PC or Mac. I rarely blog about sports, ok I rarely blog period, I know. Tonight I watched the Affliction: Banned MMA fight with Fedor Vs. Tim Sylvia. I’m a big MMA fan, you wouldn’t know it by reading my blog though. You read me correctly, 36 SECONDS! Let’s not forget Sylvia was a former 2 time UFC heavyweight champion. He’s not just your average ho-hum fighter. Fedor didn’t even break a sweat. In fact, he didn’t even look excited he won. I suspect, and this is just my personal opinion, that when he was throwing punches at Sylvia, Fedor was thinking about the resturant he wanted to take his wife too. Once he got to the choke hold, he was debating between Steak or Chicken. Honestly, it’s like Fedor doesn’t even have to try. Did anyone see him playing poker with his training staff during the opening fights! Normal people like you and I walk out side to our cars, or take a piss in the toilet, and don’t think anything of it, its just another day. Fedor walks into the ring with 200+ pound guys and thinks nothing of it, its just like getting into his car or taking a piss. It’s all part of the average day. I know, I sound like a fan boy, I don’t care. What he did tonight was truly inspiring. For all those who want to see Fedor lose, your day will come … maybe. Even the best fighters get old, or lose the fire inside them. The good fighters know when to quit while on top. Others (ie. Mike Tyson) seem to be too caught up in there celebrity to realize this. I think Fedor will continue to dominate until the day he knows he can no longer compete like he does now, and will retire while on top. However, I suspect we won’t be seeing that happen for many many years. Anyone sitting on edge for the future Fedor vs. Randy Couture fight!? After the passing of Spot back in May, my girlfriend Emily and I decided it was time for a new companion. Today we picked up our 12 week old Bengal Cat Max (I nicked named him McLovin when Emily is not around!). For those who don’t know what a Bengal Cat is, it’s a cross breed between a wild Asian Leopard Cat and a domestic house cat. Max is around a 7th generation, which means he is about 7 times removed from the actual wild Asian Leopard. However he retains the wild looking features and markings. 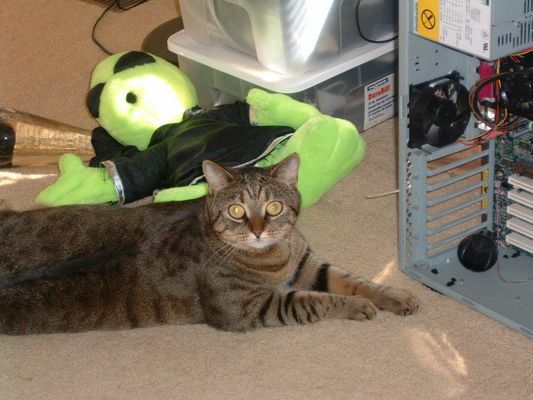 Bengal cats are known for their very ‘dog’ like personalities. They are very different from a common domestic cat! For those that don’t know, Spot passed away this morning at 4am after having surgery the day before. She had liver disease. RIP Spot. You were a great cat, and my best friend. On a positive note, the reason I left my daytime employer is that I have gone on to start my own company WebGen, Inc.. Me and my partner feel that now is the right time to make the big leap and work full time for ourselves. I’ve been keeping it hush-hush for months now, but now I can finally announce our two education portal sites, Education Incorporated and Education Quest. Going in Style (2017) Free Latest Films, Full Movie Online Watch Free, Free Movies Streaming, English Subtitles Full HD. Title : Going in Style. 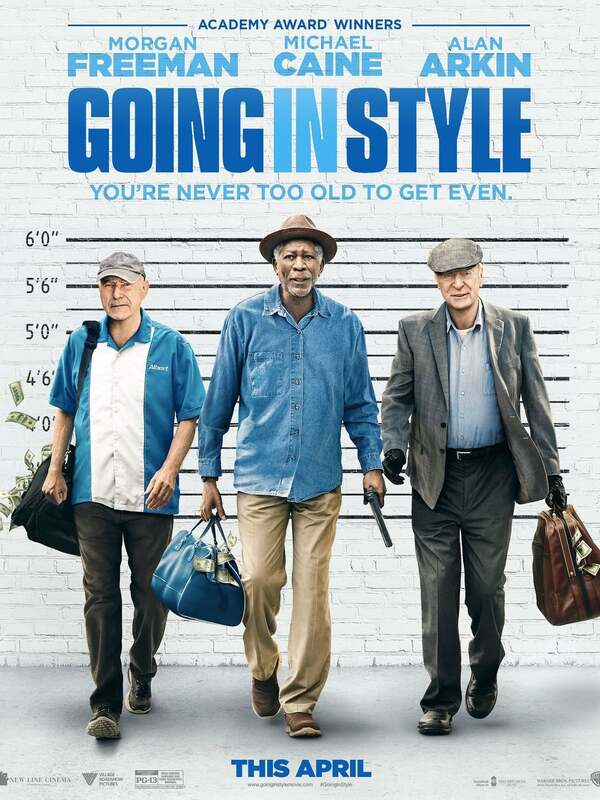 ‘Going in Style’ is exelent film tell story about Desperate to pay the bills and come through for their loved ones, three lifelong pals risk it all by embarking on a daring bid to knock off the very bank that absconded with their money. This movie have genre Comedy and have 0 minutes runtime. Michael Caine as Joe, Matt Dillon as Hamer, Joey King as Brooklyn, Ann-Margret as Annie, Morgan Freeman as Willie, Alan Arkin as Albert. The Director of this movie is Zach Braff. The movie Going in Style is produced by Warner Bros., New Line Cinema and released in April 06, 2017. We serve you with the best possible view of the facilities and procedures to follow step by step so that you (the visitor) will feel like a king. Download Going in Style, take a little time now to register for free and you can benefit later. In addition, the movie Going in Style security issues and antivirus technology, you no longer have to worry about any set of data transfer security disturb your precious PC or laptop. Also, with a different file formats such as DVD, CD, iPod, HDD and Divx, now you can really forget about replusive video format that can not be played! So guys, now it’s time for you to sit back, relax, drinking a can of cola (cold drink) or some snacks to watch Going in Style online just take 0 min, and you will feel you like in the cinema room. just by sitting in front of your computer and sign in to our site to watch Going in Style online and you could see your favorite movie the other. Changing the application that opens link in Mozilla Thunderbird 2.0, as I recently discovered, is not trivial (at least not in Linux). I’m doing this using Mandriva 2007.1 Free, so other distributions may handle this differently. Here’s what I had to do to get Thunderbird to open URL’s in Firefox. 1) Open Thunderbird, then go to the menu option Edit->Preferences. A window will open, now select the ‘Advanced’ option at top, and then click the ‘Config Editor’ button near the bottom. Thats all you should have to do, you don’t have to restart Thunderbird as the settings should take effect immediately. I hope that soon Thunderbird makes this much much easier. 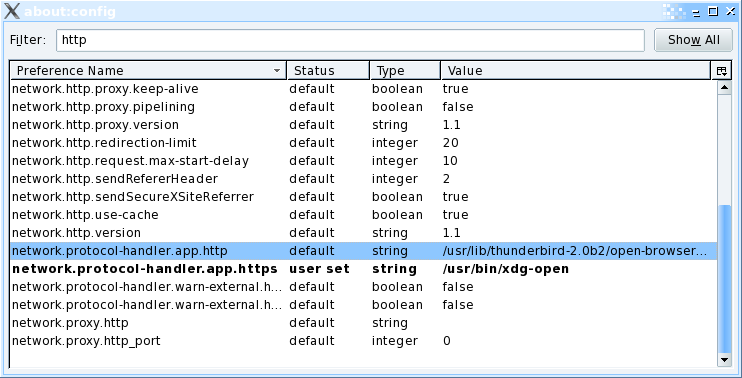 *Note: One other option you might try doing is when you have opened up the Thunderbird Config window, you might be able to edit the value of network.protocol-handler.app.http and set it to the location of your preferred browser. I have not tried doing it this way so I can’t be sure if this would work, though I suspect it would.